According to rumors, HTC is preparing to hit hard on the Chinese market. We have already heard news of the One M9, M9 Plus, as well as the E9 and perhaps even an E9 Plus, which should be hitting store is the growing Asia market pretty soon. But HTC might have yet another device up its sleeve - an 8.9-inch tabled, dubbed the T1H. It will probably be joining the ranks of the aforementioned phones in an official unveiling in Beijing this April, but the date and venue are still unconfirmed. 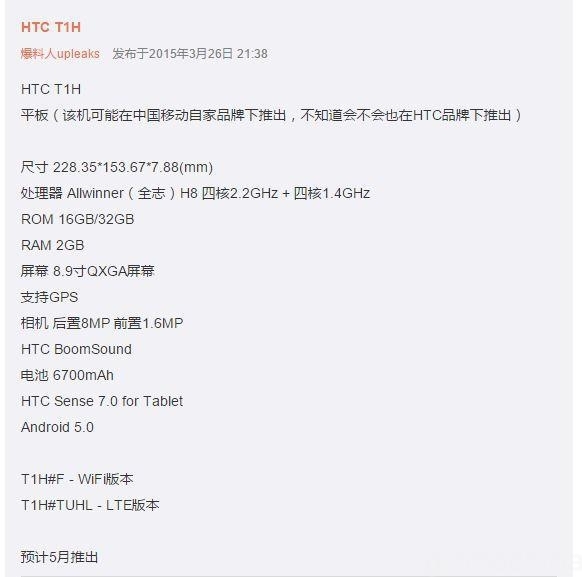 A pretty detailed specs sheet for the T1H has slipped through the cracks, as well as an alleged live photo of the unit which looks strikingly similar to the One M9, only a lot bigger. 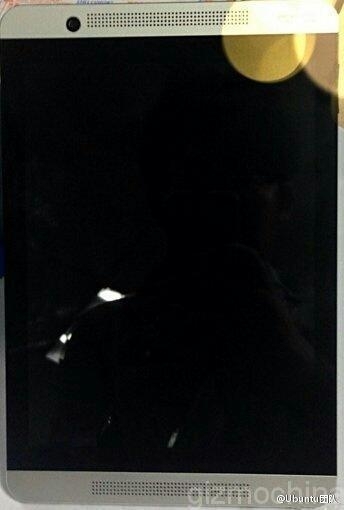 According to the rumor, the upcoming tablet will measure 228.35mm x 153.67mm x 7.88 mm with a 8.9-inch QXGA 2048 × 1530 pixel display. Interestingly enough, HTC have opted for an Allwinner SoC, instead of a more traditional Qualcomm or Mediatek solution. The chip in question is the octa-core Allwinner H8, which is built using a new 28mm production process and features the PowerVR SGX544 as its GPU. Other specs include 2GB of RAM and a choice between either 16GB or 32GB of onboard storage. Camera setup, consist of 8MP shooter on the back and a 1.6MP front-facing one. The device is going to be powered by a spacious 6,700 mAh battery and should run Android 5.0 Lollipop out-of-the-box with the HTC Sense UI on top.